The last week of the school year is always difficult, but everything is all put away and ready for next year. It's funny-- if you work ten hour days for 185 days, it's possible to get caught up! The problem is that after school is out, it takes a week for me to change grooves. High school graduation and the attendant parties to which my daughter went made it hard for me to concentrate due to lack of sleep! I spent several days reading magazines and trying to get caught up around the house. When I emerged from my year end fog, I realized that I didn't have much to read, so had to dip into my Book Look pile, which was mainly girl books. I am heading to the library soon, and will get back on track. Eloise always knew that her aunt Antonia had some problems that kept her out of touch for much of the year, but she did not realize that these problems stemmed from the fact that she was married to the Faery king, who is angry with her aunt and kidnaps Eloise to get back at her. Luckily, Eloise has good friends Jo and Devon who are able to help her excape, and there is also the very hot Fae Lucas who is on her side. Strahan does not want to give up his crown after serving for seven years, as tradition dictates, and this has thrown the entire faery realm into chaos. Eloise gets a good look at this world, starts to learn more about her aunt, and realizes that she is somehow the key to the survival of both worlds. Strengths: This is a different paranormal romance from many of the ones I have read. Harvey's vampire series, as well as Haunting Violet, are popular in my library and are middle school appropriate, which I appreciate. Weaknesses: Going between the points of view of Eloise and Jo seems confusing since I was also trying to understand the faery world. McDonald, Abby. Getting Over Garrett Delaney. Sadie has been best friends with Garrett for two years, ever since she saw him and knew immediately that they were meant to be together. They watch the same movies, read the same books, and SOME DAY, Garrett will realize as well that they should be more than friends. 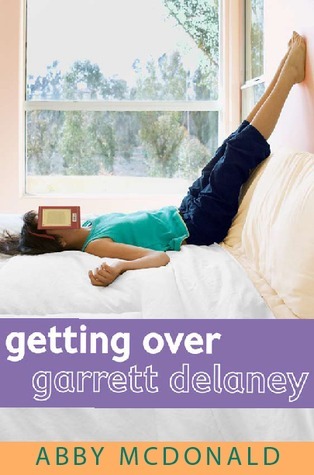 When Garrett ends up going to a summer writing camp without Sadie, she starts to realize that he relationship with Garrett borders on addiction, and she really needs to move on. She gets a job in her favorite coffee shop and makes some new friends, as well as reconnecting with an old friend she has ignored while with Garrett. With the influence of her life coach mom, Sadie makes a 12 step program for herself, which includes detoxing her system of Garrett. She realizes that she no longer knows who SHE is, only who she is when she is with Garrett. With the help of her friends, she starts to identify the person she would like to be. They have a good time, and Sadie feels that she is free of Garrett's influence-- until he comes back from summer camp. She starts to realize that as much as she likes Garrett, the relationship isn't healthy, and starts to be able to move on with her life. Strengths: *Sigh* Unrequited love. Is there anyone who made it through high school without it? Oh, wait. A lot of people. It was just me, pining hopelessly for Jon all those years. Well, for those of us who consider Janis Ian's At Seventeen the most brilliant song ever, this is a book that makes us feel that there might be some hope. I love the ending, which didn't seem forced. Good, good stuff, AND middle school appropriate. Weaknesses: This was painful to read, since Sadie's reliance on Garrett was so desperate. I do like this author's Boys, Bears and A Serious Pair of Hiking Boots, but am jealous that she went to Oford University! Lex is a very violent high school girl, and when she gets kicked out of school yet again, her parents decide to send her to the boonies to live with her uncle Mort. It turns out that her recent violence is just her family heritage cropping up-- Mort lives in the town of Croak where everyone has something to do with death. Lex turns out to be a very talented Killer, and paired with the somewhat annoying but somewhat attractive Driggs, she helps people's souls to be released from their earthly bodies and moved to the next realm. Lex feels that she finally has found her place, although she misses her twin sister, but when there are irregularities cropping up with Killings, Lex is suspected. 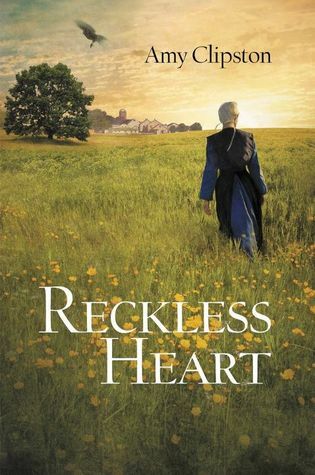 Can she continue her work even while under scrutiny, and when a family tragedy occurs? 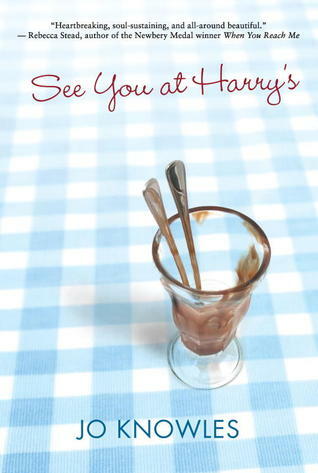 We'll find out when the next book, Scorch, comes out 25 September 2012. Strengths: My students love murder mysteries, and this certainly has a decent amount of death and a bit of murder. It's treatly lightly but not cavalierly, and the Vladimir Tod crowd will take to it very readily. Even the covers are a bit alike. Weaknesses: The book starts out with a lot of vulgarity, but then it lessens a bit. It's not bad, just a tiny bit more of a high school book. It is also available in paperback or prebind only, so I will have to think about this one. Reviewed for YA Books Central. Granny Relda's body has been kidnapped by Mirror, who is trying to use her to get out of Ferryport, which is a complete wreck. Sabrina and Daphne's parents are back with their traumaztized baby brother Basil. 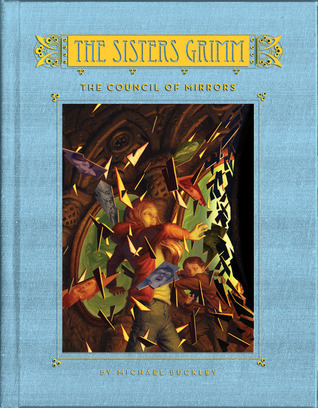 When the Wicked Queen comes back and puts the fragment of the other magic mirrors back together, they deliver a prophecy-- only the girls can save the Everafters. Sabrina puts together a coven, they gather their forces, and have to fight the evil Atticus. 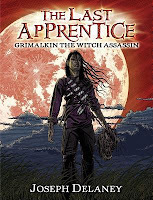 There are huge battles, lots of action, and every known character in this final addition to a well liked fantasy series. Strengths: Again, the action and fighting run rampant through the book. This series has been popular in my library (for some reason I've only blogged two--The Usual Suspects (#2), Inside Story (#8)), especially now with all of the Grimm related television shows around. Buckley does a good job at working in a lot of characters and keeping the mythology consistent. Weaknesses: There are a LOT of characters in this book, and I'm a bit confused why characters from Oz and other stories are included. I still don't like Puck, I still think the bindings are awful (the first book came out in 2005 and even though I tried to put a mylar cover on it, it's filthy and looks... chewed. ), and I find that with any fantasy series of longer than five books, it's very difficult for me to keep track of all the previous story lines, although students who are interested enough to make it through all of the books don't seem to have this problem. Jinks, Katherine. The Paradise Trap. Marcus is less than thrilled when his mother inists that the spend the summer at Diamond Beach, living in a very gross and rundown travel trailer. He's even less thrilled when they pull into the cheaper end of the park and realize that they can't even see the beach from where they are. When they travel to the water, they have to pass through the spiffy new area with the expensive trailers, and Marcus' recently divorced mom, Holly, runs into a woman she knew as a girl at the beach. Coco's husband is a tech inventor, and their house is filled with all sorts of upgrades. Marcus meets Coco's stepchildren, Edison and Newton, and they visit Marcus' trailer, only to find out that it has a cellar. In the cellar is a Land of the Lotus Eaters type trap-- it will provide you with the best vacation you could imagine. Edison gets sucked in first, then Newton, and when Marcus tries to get Coco to help, she gets sucked in, too. It turns out that the trailer has a connection to Holly and Coco's past at the beach, and may hold the key to the disappearance of a boy on whom Holly had a crush. 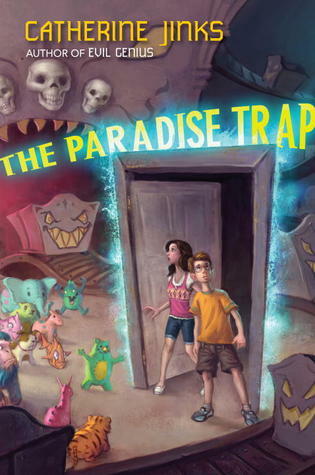 Can Marcus and Edison figure out what is going on in time to save everyone from being trapped forever in their own version of paradise? Strengths: I liked Jinks' Living Hell as well as her Pagan's Crusade series, and of course Evil Genius. I wasn't sure I would like this one, but I really did. Even though Jinks is Australian, and a lot of Australian books fall flat for me, she always turns out a good tale. Of course, now I want to go camping in a trailer! Weaknesses: Not a great cover, which might explain my initial disinterest. Also, this is one of the few books where I would have just cut out the last few chapters. I don't want to give away the great twists and turns in the plot, but when I thought that things had been successfully resolved, the last quarter of the book took off into a completely different direction, and was somehow not what I wanted to read about! I was feeling kind of "meh" about everything on my TBR pile, but then I came across this! The first three books in this series (Swindle, Zoobreak and Framed) were okay, but not quite as good as some of my favorites-- say, Son of the Mob or Born to Rock. What I did not remember was how beautifully simple, funny, and engaging EVERYTHING Korman writes is. This book made me happy. Griffin's inventor father and his mother are off on a tour of Europe to try to sell his inventions. Griffin is staying with Ben's family for six weeks in the summer, and given all of the boys former exploits, Ben's parents are a little concerned. 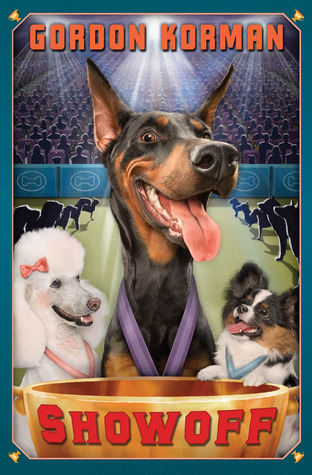 When the boys end up at the mall with their friend Savannah and her enormous Doberman, Luther, things go badly awry. Luther is responsible for the tail injury of Electra, a beagle who is a shoe-in to win top prize in the Global Kennel Competition. Slapped with a law suit, the only way Savannah's family can see to get out of it is to take Luther to the pound. 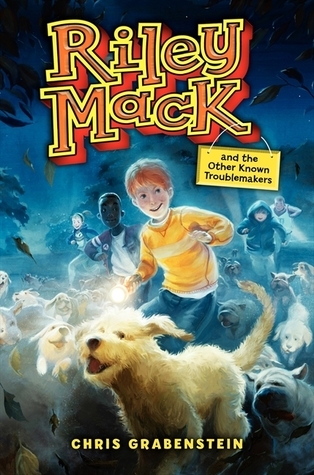 Knowing how much the dog means to their friend, Ben and Griffin spring Luther from the pound, hide him, and hunt down famed yet elusive dog trainer Dmitri Trebezhov to get Luther in shape to win the Global competition so Savannah's family has money to pay the lawsuit! Oddly, Dmitri agrees to train the dog, Luther complies, and even though someone is trying to sabotage Luther's chances, the boys, not surprisingly, manage to thwart complete and utter ruin. Strengths: Would someone in publishing please pay attention? This is a perfect middle grade book, and that perfection starts with two very simple things: Appealing cover and LARGE FONT! Cannot tell you how many times I hand a book to a reluctant reader only to have them turn up a nose at the ten point font. Fourteen point AT LEAST. Thank you. And to this engaging characters with an aptitude for destruction, goofy yet not over-the-top circumstances, and a bit of Nair sprayed through a hole in a door... good stuff. Weaknesses: The inventor father was almost over-the-top. And yet the dog trainer who took a huge Doberman to an Italian restaurant to eat linguini strand by strand was not. Hmmmm. Shep, Callie, and the other dogs leave the animal shelter and meet up with Honey and Fuzz, a cat who can speak dog! Shep decides to let Fuzz into their pack because of Honey's attachment to him. The pack doesn't have a safe space to sleep, and when they finally find an abandoned boat, fights break out because of the crowded circumstances. There are problems with wild dogs as well as alligators, but Shep does meet the fierce Blaze, a girl dog to whom he takes a shine. Every day is a struggle, because food is scarce and pack politics are complicated. At one point, Shep decides to throw Fuzz out of the pack, with disastrous consequences. 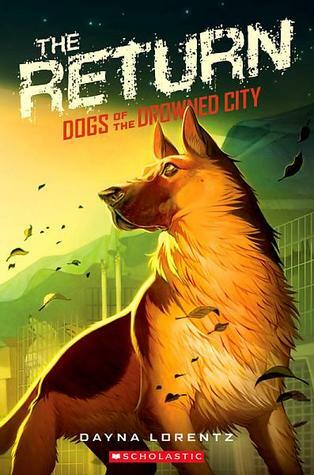 Just as Shep is beginning to get his pack to a point where they have food, shelter, and can get along with each other, humans start arriving back in the city and kidnapping dogs. Strengths: Like the Warriors books, this series focuses on the survival of animals who have to deal with both each other and the privations of their environment. I was able to tell the dogs apart much more easily than I could tell the cats apart, and the exterior crisis of the flood (basically something like Hurricane Katrina) makes the survival seem more realistic. Weaknesses: As in the first, sometimes describing a place or event in the way that dogs would explain it was needlessly confusing. More and more humans arrive back and are picking up dogs, but Shep has decided that he likes to be free to hang out with other dogs, chase squirrels, and not be cooped up. The others dogs, however, still want to find their families. Callie has been taken to a pound, but the dogs locate her and break her out. Callie is upset that Shep was mean to the woman. At the same shelter, they pick up Pumpkin, a friendly young Yapper. The dogs decide to head to the beach, thinking that it will be easier to locate their families once they are there. Zeus joins the group, so Pumpkin gives all the dogs "cute" lessons so that they will not seem threatening to humans. After meeting up with a dog who was not separated from his humans, and getting some food and kindness from the humans, Shep feels that he might like to find his boy. When he is later attacked by a shark, it seems like an even better idea. How can Shep be a good pack leader and take care of all the dogs AND find his way back home? Strengths: A three book series was just right for this topic, and moved the plot along nicely. Shep's philosophical musings were interesting. Weaknesses: I think these are all in paperback only, so I'll have to find prebinds for my library. Bondy, Hailey. Don't Sit on the Baby. I remember going to a Babysitting Clinic when I was in 6th grade. It was a big deal-- we got certificates at the end of it, and the local newspaper published the names of all the graduates. I don't know that many 6th graders babysit now, but if they did, this would be a great book for them to have. 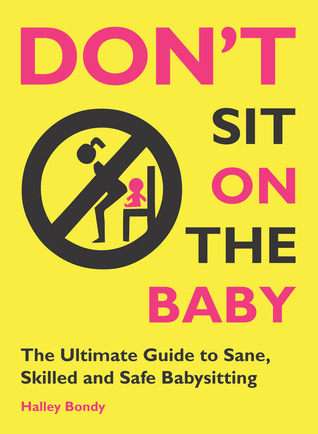 There are three sections to the book; what to expect from babysitting, essential skills, and how to deal with the business end of sitting. The inclusion of descriptions of what to expect from various ages of children was especially handy and would probably be good for new parents to read as well! The skill section is incredibly detailed, giving tips for everything from feeding and dealing with toilet issues to how and what to play with children of various ages. There are also sections on how to discipline children, how to deal with emergenices, and how to put children to bed successfully. I could have used that with one family of five that I frequently babysat! The business section is also helpful, giving information on how to find employers, what to expect in pay, and how to tell parents that you can no longer work for them! The only information I can remember getting about babysitting was that it was important to get the parents' contact information, the bedtimes of the children, and the location of the snacks! This would have been a very helpful book to have, even though it does seem to be aimed at babysitters over the age of 14, since it includes things like driving children places and working as an overnight babysitter. Lydia has a very busy life-- she is an assistant teacher at the local Amish primary school, and also helps out at her grandmother's bakery. Her four-year-old sister has been very ill, and after consulting doctors, the family has a diagnosis-- leukemia. In order for Ruth to receive treatment, she will have to stay at a hospital, and the mother will stay with her. Lydia now has to add household chores to her schedule. It's little wonder that when she was at a youth group meeting and the attractive Mahlon plies her with beer, that she drank it to try to escape the reality of her life. She starts to feel that this was not a good idea, since Josh, the boy she likes, seems to think less of her because of that incident and also because she has made friends with Tristan, a neighbor boy who is not Amish. Lydia's strict parents are also unhappy with her and group her from all activities. Will Ruth get better? Are Tristan and Lydia just friends? Will Lydia become a full time teacher, or decide to work in the family bakery. Strengths: Michael of Middle Grade Mafioso had a great post at Project Mayhem about What Are Middle Grades Taboos, and "religiously observant characters" came out on the taboo side. Zondervan is, of course, a religious press, and they turn out a fair amount of books with characters who do have some religious bent. This, of course, had more than others. This made me think a little about Virginia Sorenson's Plain Girl, which is still available. Weaknesses: The interpolation of Pennsylvania Dutch words seemed a bit forced, and I don't know about the audience for this one. Katy isn't happy when her father moves to New York City to be with his evil girlfriend "Mim", who is an executive at Wonderland, a store that has odd connections to Katy's past. Because of the move, Katy is sent to a boarding school nearby, Ainsworth Preparatory. From the time she arrives in the small New England town, everyone around her is weird. Cab driver calls her another name. Hot guy Peter practically spits at her. People talk behind her back about her mother, who apparently tried to kill Peter's brother and then killed herself in a house fire. Things do improve a little; she meets Hattie and is hired to work in her restaurant, and meets her aunt and great-grandmother. Katy also finds out that the community in Old Town Whitfield is full of witches, and she is one as well, although her father was not. Peter stops blaming her for his brother's handicaps, she learns about some magic, and Mim's attempts to take over a sacred field in Whitfield in order to build a new Wonderland store are comically ruined. Then the real problems arise. The Darkness is around, as it has been at times over the years, and harbingers suggest that it is nearer than anyone might think. Peter and Katy try to stop the Darkness, but this turns out to be difficult because of many factors. How can the two save themselves and the community from devastation? Strengths: I have a very low tolerance for paranormal romances, but I kind of liked this one. 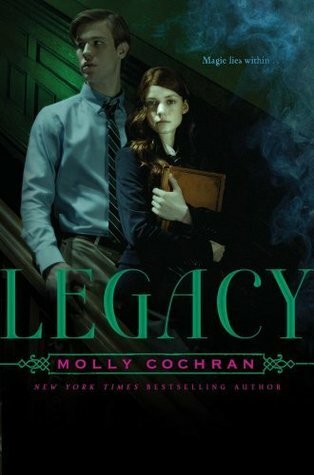 The cover reminds me somehow of Lois Duncan, and even the blurb made me think of Down a Dark Hall, even though the school did not figure very largely in the plot. I liked Katy and Peter, liked the romance, found the town and all of the characters that Katy gets to meet somehow endearing. Would not mind a sequel. Weaknesses: Did start to drag about halfway through. Found myself not caring exactly how the problems were solved, since I knew they would be, just wanted them solved. It was a bit odd that there was so little about school, but I did like the book. Grabenstein, Chris. Riley Mack and Other Known Trouble Makers. 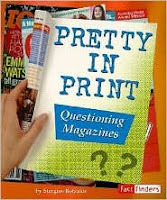 Reviewed for Young Adults Book Central. Riley's father is serving in Afghanistan, and his mother is working in a local bank. Riley's a good kid, but when his father first shipped out, he made the mistake of trying to steal an ice cream cake by putting it down the front of his pants, and now the police chief has it out for him. To make matters worse, the chief's son, Gavin, is a major bully who is stealing things from 5th graders and his Grandma Brown is hawking them at the local flea market! Riley has a good group of friends who help him keep kids safe from Gavin, including Briana, who has hippie parents and likes to dress up and act out roles; Jamal, who is very smart;Jake, a tech geek; and Mongo, who is very big and whose family has just gotten an expensive goldendoodle named Noodle. When the kids figure out that Nick from Pizza Palace stole the dog and that Grandma Brown is running a puppy mill, they work to rescue the dogs. Things get complicated when the manager of the bank where Riley's mother works loses money gambling, steals it from a widowed bank customer and tries to frame Ms. Mack for the theft. The kids try to break into the bank to get evidence at the same time two criminals are trying to rob the safe. Can they clear Riley's mother's name, save the dogs AND bring down Chief Brown? Strengths: I really liked The Crossroads series, and Grabenstein certainly writes engaging prose. Riley is a fun character, and I think that middle grade students will like this book, especially since dog books are asked for more and more. Weaknesses: All objections are on a personal level. Students will like this. While this was a quick read, I didn't care for it as much as Grabenstein's other books. It included over-the-top bullying, which I always dislike, and dog napping, which has become a cliche in children's literature. The characters were rather stock, and the inclusion of hippie parents is another thing I routinely dislike. Students will probably not notice these things, but I expected something more original from this author. It's a new record! I only have TWO books that haven't been turned in or paid for. Five that walked away. Have I said lately that my students and staff are beyond AWESOME! I think the numbers show that my school has a lot of respect for books. Ms. Reader Pants had a list of her most circulated books over at her blog, and I thought it was interesting. When looking at this list, notice that there are two entries for Stormbreaker; this is because I have both hardcover and paperback versions. 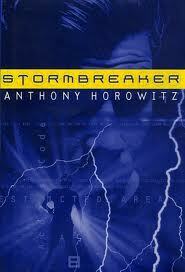 In all, The Hunger Games circulated 174 times, but Stormbreaker went out 188! Not bad at all for a ten year old title! And you can certainly tell that we love us some Rick Riordan, with six of the 20 being by him. Carey, Benedict. 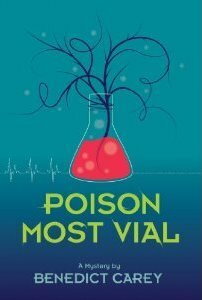 Poison Most Vial. When Ruby's dad, a custodian at an urban university, is accused of murder when Professor Ramachandran's tea is poisoned... and he made it! Ruby feels that the only way to get her father off is to investigate herself, with her friend Max and the retired toxicologist Clara Whitmore. Mrs. Whitmore has ties to the police still, and is able to get the professor's autopsy report, and a variety of people help along the way, but it's up to the children to save the day. They interview people who were in the area, look into the professor's past, and find clues all over the lab area. There is some computer hacking, a few unpleasant characters at school to be dealt with, and a lot of information about poison. Can Ruby manage to get her father off so he doesn't go to jail and so he can get his job back? Strengths: This was a rather clue oriented mystery, and the characters are all very well developed. Weaknesses: I found this one slow going. Too many older adults, a lot of anxiety, and not very much adventure. I'm still debating buying it-- the cover and title are great, and students always ask for murder mysteries. Shoemaker, Tim. 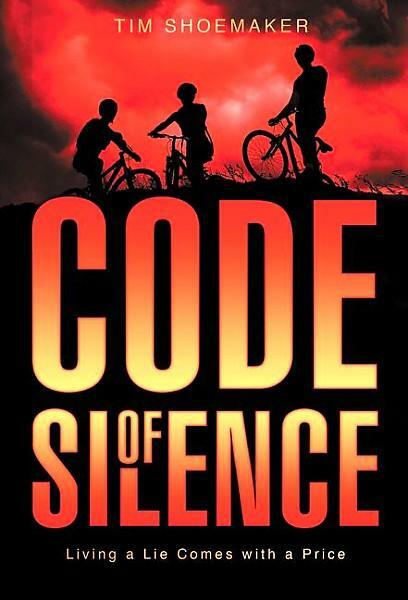 Code of Silence: Living a Lie Comes with a Price. 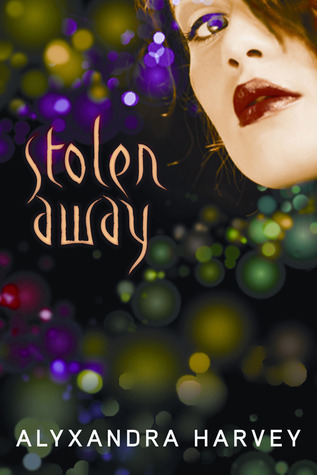 From the Publisher: "When Cooper, Hiro, and Gordy witness a robbery that leaves a man in a coma, they find themselves tangled in a web of mystery and deceit that threatens their lives. After being seen by the criminals---who may also be cops---Cooper makes everyone promise never to reveal what they have seen. Telling the truth could kill them. But remaining silent means an innocent man takes the fall and a friend never receives justice. Is there ever a time to lie? And what happens when the truth is dangerous? The three friends, trapped in a code of silence, must face the consequences of choosing right or wrong when both options have their price." I couldn't get into this book. I had the digital ARC, so maybe I need to try to find a paper version. Again, I need lots of mysteries, and while this one has a bit of action and suspense, but somehow not enough to draw me in. Hate to say that I'm about caught up, but really, if you work ten hour days for 183 days, shouldn't you be about caught up? Have four inexplicably missing books and six overdues. Today is the last day of school. Equipment will be coming in-- overheads, televisions, carts, Mimeos, LCD remotes. Also, really need to work on book orders. They are a mess, and I will need to come in 19 July in order to have new books for the first day of school. Eep! So much for being caught up! Feinstein, John. Rush for the Gold. Susan Carol and Stevie are back, and this time Susan Carol is very close to making the Olympic team. She is approached by all sorts of agents and sponsors because she is not only a fantastic swimmer; she is also pretty. Her father is bowing to the pressure for her to wear logos at every interview, which confuses and angers her. 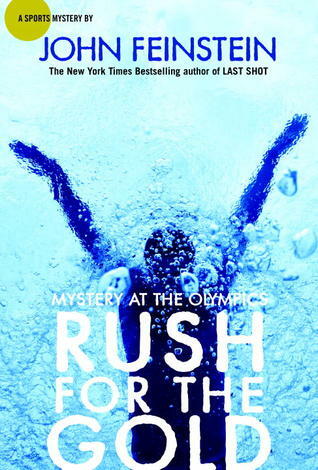 Stevie, writing for the Washington newspaper, manages to go to the Olympic trials to be with her (their long distance romance seems to be working better than most), and when she makes the Olympic team, he goes to London as well. While in London, the politics and agent anxiety increase-- Stevie is yelled at for talking to Susan Carol and not getting proper permission to speak to other swimmers. He has to struggle with balancing his reporting with wanting to be with his girlfriend all the time. Susan Carol has to struggle with an increasingly overbearing father who wants her to fire her long time coach because he isn't "big time" enough, and with the pressure to win a gold--so that she can earn the big bucks in sponsorships. When it is clear that another girl, Elizabeth, is a better swimmer but not as pretty and personable as Susan Carol, Susan Carol becomes angry that looks count for so much. Is someone sabotaging Elizabeth because she isn't as attractive? Stevie and Susan Carol are able to use their well-honed investigative skills to figure this out. Strengths: Even though this book is about a girl, the guys will still pick it up. I was oddly intrigued by all the swimming descriptions as well as the machinations of the agents. Feinstein's background as a sports news writer is always apparent, and that's a good thing when trying to hook reluctant readers. I love this series and would really like to see Mr. Feinstein write some stand alone titles about basketball or football. Weaknesses: While the inclusion of actual athletes as characters will add immediacy to the story now, it will also cause it to date, like R.R. Knudson's Zan Hagen's Marathon. Also, because I am not at all familiar with swimming personalities, I wasn't sure which characters were based on real people and which were purely fictional. Colt is back with his friends Oz and Danielle. They are concerned because the government is warning people away from a nuclear reactor meltdown, but the real problem is an alien virus from which no one recuperates. There are too many things going on to worry about that for too long. Oz's father, Lobo, has hired Krone, a Thule shape-shifting assasin, to kill senator Bishop, who is a friend of Colt's grandfather, The Phantom Flyer. Once Bishop is dead, Krone comes after Colt, although Colt doesn't really know why. It's time for the three to head off to CHAOS training, anyway, and of course they run into all sorts of problems on the way, like flying jellyfish attacking their jet! At the academy, the students learn to fly hoverboards and deal with the Thule invasion, while trying to be polite to more sympathetic life forms. Krone is still hunting down Colt, and when he finds him, shape shifts into Danielle's form and injects Colt with the virus! Who is more evil, Krone or Lobo? Will Colt survive the virus? What about his alien blood? And more importantly, when will the final book be out? Strengths: Wow! It's impossible to write a review of this without exclamation points! They have antique jet packs! And have lots of fights! The chapters are short! Weaknesses: While this is certainly an action packed tome that has the added bonus of comic strips in the front, it was a little lacking on character development and, well, reasons for things to be exploding. See? I have not completely turned into a 12-year-old boy! 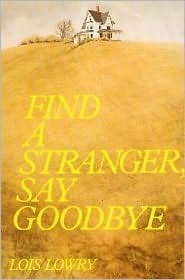 This 40th anniversary edition tells the tale of Susan Shaw, who lives in an apartment building with her widowed father. When she goes missing, the whole complex is thrown into a tizzy, and it's not any better when a note appears in Susan's handwriting, telling her father not to worry, and that she will be home soon. After meeting and helping a strange old lady on the street, Susan has been able to travel from 1960 back to 1881, and has met a very nice family. 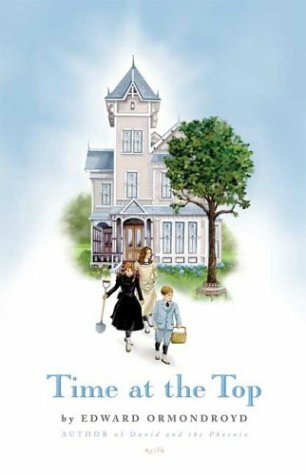 Victoria and Robert are at first taken aback, but then intrigued that Susan was able to take the elevator in her building "to the top" and end up back in their time. They are very worried about their widowed mother, so when Susan reads, in the present day, about treasure being found not far from their house, the children look for it so the family will have no money problems. There is still the problem of both parents being widowed, and Susan has to decide whether living in the past with "swishy" dresses would be something that she would like. Strengths: This observes my most important rule of time travel-- it doesn't work too hard, just asks you to believe. Is a little bit of a twist, since Susan spends more time in the past than many characters do. Definitely shows the 1950s affinity for the late 1900s. Weaknesses: A bit dated, both in details of Susan's everyday life and in the writing style. It is criminal that the original Charles Geer illustrations were replaced in the 2003 reissue. Just not the same! His illustrations, as well as those of Joe and Beth Krush, are some of my very favorite! Lorentz, Dayna. No Safety in Numbers. From the Publisher: "Life As We Knew It" meets "Lord of the Flies" in a mall that looks just like yours. A biological bomb has just been discovered in the air ducts of a busy suburban mall. 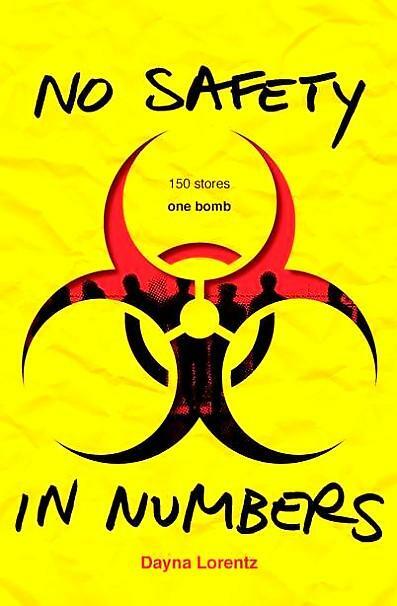 At first nobody knows if it's even life threatening, but then the entire complex is quarantined, people start getting sick, supplies start running low, and there's no way out. Among the hundreds of trapped shoppers are four teens. These four different narrators, each with their own stories, must cope in unique, surprising styles, changing in ways they wouldn't have predicted, trying to find solace, safety, and escape at a time when the adults are behaving badly. This is a gripping look at people and how they can--and must--change under the most dire of circumstances. And not always for the better." Well, who wouldn't want to read that? 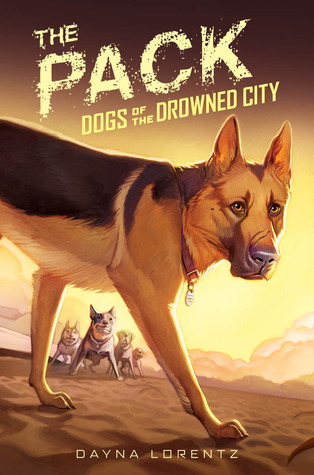 And since the author did the really good middle grade title The Storm: Dogs of the Drowned City, I had great hopes for this. However, a completely gratuitous f-bomb appears on page THREE. Young Adult does not mean Potty Mouth. I refuse to condone or financially support this type of writing. It just makes me feel sad and weary and old. Montgomery, Monte. 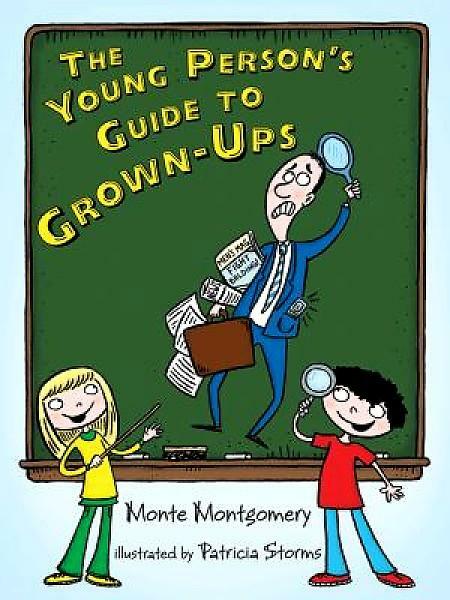 Kid Confidential: An Insider's Guide to Grown-Ups. Keeping this theme in mind, this handbook discusses grown-ups at home and at school, how to stand, understand, and how to manipulate them. It covers why adults are insecure about their appearance, vocabulary that they use, and how to communicate with them. Strengths: Part self-help book, part satirical description, this was a fairly humorous book with some good hints; the chapter on librarians ("Librarians: The best friend you'll ever have who'll tell you to shut up", page 99) is fairly flattering and spot on ("All librarians are crazy, but they're crazy in the coolest way possible: they're crazy about books." ). Weaknesses: I'm not sure exactly what this IS. Dewey 818. American Miscellaneous Writings. This is one I'm just not sure about-- may have to wave at children and see if they would pick up a copy if I had it in my library. Nonfiction Monday was started by Ana Suen and is hosted this week at Apple with Many Seeds. Major SQUEEEEEEE! The Revenge of the Witch is being made into a movie called The Seventh Son! It's supposed to come out in 2013, and Jeff Bridges is the Spook. Yes, yes, I know I still haven't seen the film version of Cirque du Freak, but it's always fun when a book that is popular in my library but is NOT The Hunger Games is turned into a movie! I was concerned that this book would not advance the plot of the series, but it does, and it makes sense that Tom is not the main character. The Fiend has been captured and bound, with his body in a remote location trussed up in silver, but Grimalkin is forced to carry his head around in a sack so that his followers can't get it to reunite with his body and reanimate him. This does not stop the followers from producing a kretch that is on Grimalkin's trail. Even with the help of her apprentice, Thorne, Grimalkin is poisoned in a fight with this monster and needs the help of Agnes to survive. In her weakened state, she continues her trek to permanently disable the fiend, hunting down lamias who knew Tom's mother and trying to get information from them. After they rescue Will, a young nobleman, he pledges the help of his father's soldiers, which Grimalkin desperately needs. Unfortunately, Will's father dies without defeating either the kretch or the mage supervising him. Grimalkin must turn to Alice, asking her for help in healing, and also for some of Alice's magic. If Alice does this, however, she will become a fully malevolent witch. While some things are resolved in this book, the Fiend is still a threat, and will continue to be until the end of book 14, which is supposed to be the last installment! Strengths: LOTS of action, adventure, and gory killing of monsters. This was a surprisingly violent book, which the students will like. I preferred scenes like the dilemma of Alice. Weaknesses: Again, very violent. The book also starts with the discussion of how Grimalkin wanted the fiend to leave her alone, and the only way to do this was to have his child, whom he then murdered. This is a bit much for 6th grade. Depending on what the next book in the series is like, this one might be one to skip. It's Marvelous Middle Grade Monday, hosted by Shannon Whitney Messenger over at Ramblings of a Wannabe Scribe. Middle Grade is so hard to define. I know that our high schools do not carry The Last Apprentice series at all, but I doubt that many elementary schools do, either. When I was in middle school, it was a true middle school-- grades 5-8. To me, that is the middle grade audience, but everyone else seems to go down to second or third grade for this designation. Any thoughts? Is this series middle grade? What ages do you think middle grade encompasses? Corinna's mother has died over the summer after a very brief bout with cancer that leaves Corinna and her father reeling. Going back to school is hard, because someone is forever saying something insensitive. Her best friend, Joci, doesn't understand why Corinna kept so much to herself, and retreats from the friendship. Luckily, there is a new girl, Clare, who understands how Corinna feels because Clare's father died several years ago, and it's still hard. There are neighbors and friends who are helpful, and some who are not, there are hard anniversaries, and a grief support group at school that Corinna grudgingly finds to help. Following the year after her mother's death, this book describes in great detail the different stages of grief and coping that Corinna and her father travel through. Strengths: The bio on the back flap says that Ms. Geithner has worked with children who have experienced a parental death, and this clearly shows in the wealth of details. The story does move along well, and while Corinna is still grieving after a year, things are improving somewhat. Weaknesses: VERY sad. This was hard to read in one sitting, since there are so many painful details. Fern's parents spend a lot of time at the family restaraunt their grandfather started, Harry's, and love to use their family in the commercials. Sara is taking a gap year and not thrilled with the whole idea, although she does appreciate one of the busboys. Three-year-old Charlie is a handful, but the light of everyone's lives. Holden is struggling with bullies at school and his first romance... with an older boy, Gray. Fern is just trying to understand her friend Ran, to take care of Charlie, and to help Holden with the painful process of coming out to their family. When a tragedy occurs, Fern finds it hard to do even the simplest things and isn't sure that life will ever be right again. Strengths: This will be one that teachers love. Holden's story is certainly well done and compelling, and seeing it through Fern's eyes is an interesting way to approach it. Weaknesses: The tragedy completely swamps the story in pages of catatonic, unable to cope handwringing. I am sure this is exactly how a close-knit family would react; I just didn't find it interesting to read about. Middle school students usually like to read stories without so much parental involvement, and younger students might not understand the nuanced story of Holden's self discovery. Did learn that I will read any book with blue gingham on the cover! 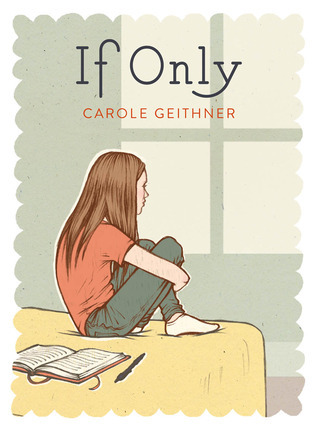 Natalie is perfectly happy with her kooky, artistic mother and her supportive doctor father, but as she is preparing to graduate from high school and make her way in the world, she is curious as to what would have caused her birth mother to give her up for adoption in 1960. For a graduation present, her parents give her all of the documents that they have surrounding her birth, as well as a credit card for expenses, and their best wishes. Before long, she is traveling to the town where she was born, visiting with doctors and nurses who were at the local hospital at the time, and consulting old newspapers and yearbooks at the public library, and tracking down a series of people before finding her grandmother's phone number and getting the contact information for her birth mother, who lives in New York City. Traveling there, she doesn't quite know what she wants, or what she will find, but knows that she has to answer the questions about who she really is before she can get on with her life. Strengths: This is still available, in hardcover, from Houghton Mifflin! The search for identity and the longing to know about the past is still palpable. It is more of a young adult novel due to some of the themes. I must have read this in high school-- the cover is so familiar-- and I love Lowry's early work. Weaknesses: This is unfortunately rather dated. Aside from the mentions of fountain pens and milk men, the whole concept of adoption has changed so radically in the last 35 years that the premise of not having any information about one's birth mother might be incomprehensible. Also, this book was written before the internet, so the whole search process would be completely changed. I love to knit and sew, and feel somewhat bad that I don't have any books on these topics at my library, having removed shelves and shelves of 1960s and 1970s books on macrame and knitting bizarre, scary toys that are sure to give children nightmares. 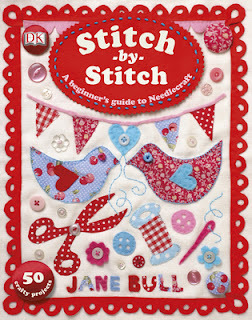 This book is VERY pretty, and has excellent directions on a variety of projects that students would find easy to do. There's cross stitching, embroidering doodles, making buttons and felt flowers for jeans jackets, and knitting some rather cool things. My one objection is the section on quilting, which I didn't understand at all. I've certainly seen a lot of paper piecing, but the instructions in this book completely ignore regular piecing and don't mention rotary cutters at all. I can see that, given how dangerous one could be in the hands of a 12-year-old, and maybe this is how the British quilt, but it seemed very bizarre to me. Still, since most of the projects are really nice, I may have to buy it! Feeling celebratory because I finished inventory! Above is the picture of all of the fabulous Great Educator Mentor Award Winners here in Westerville. Notice the rather high percentage of winners who are librarians! Inventory: There are 10,797 books in the library, and this year I checked out 37,717! This is a 6.23 % increase over last year's 35,505! (And for those of us who are math impaired, there is a Percentage Change Calculator that made me so happy!) My very first year, we only checked out 13,642. And how many books should be on the shelf that just inexplicably AREN'T? Bwa ha ha ha ha!!! I have most of my books back home AND a shiny crystal award. Life is good. Have a great weekend! The most popular wars for boys to want to read about have been World War II and Vietnam for as long as I have been a librarian. While there are a fair amount of WWII books, there has been a notable lack of books about Vietnam. Since many of my students have grandfathers who fought then, there has been an increase in requests for these books, but not an increase in books. Here are two very good ones. In I Pledge Allegiance, we meet four friends growing up at the height of the Vietnam conflict. Rudi is the first to get a draft notice, and is visibly upset. Morris is resigned to going, Beck wants to keep his hair long until the very last minute, but Ivan is gung-ho. His father fought with Patton in WWII, and as long as the fight is a good fight (and any fight for your country falls into that category), it's okay. Sent on a ship to Vietnam, Ivan is trained to be a sniper, and tries to do the best that he can, while most of the other men are just counting the days until they return home. The more experience Ivan has with war, the less enchanted with it he becomes. After he kills his first man, for example, he gets a tattoo, but on the inside of his bicep instead of somewhere showier. Eventually, the horror of the war catches up even with Ivan, and he, too, starts to count down the days. Strengths: The details in this short book are relevant and fantastic. From pop tabs that come off cans (am I the only one who really misses those), to details of the fighting, Lynch does an excellent job of making one feel there. In the first book, I was concerned at how was was almost glorified; it is not in this book. This series is a must have for middle school libraries. Joel Bloom is living in a small Massachusetts community in the wake of World War II. The fathers of all of his friends fought in the war; his father was an officer, and it is Joel's expectation throughout his childhood that he will one day grow up and fight for his country. He and his friends play "war" using German and Japan relicts that their fathers brought back. As they get older, Joel and his friends turn more to baseball, and are caught up in current events. One friend's father dies in Korea, which at the time was referred to as a "police action". President Kennedy is elected, and then he is killed. Joel graduates and goes off to college in order to get a draft deferment. He becomes politically active when he meets a girl who is socially conscious, but eventually has to register for the draft. He feels that he cannot go to Vietnam and kill people, so applies for conscientious objector status. When this is denied, he decides to go to Canada. Strengths: It is hard to do this book justice. While the chapters follow Joel's growing up years, they are so well written that his reactions to the events of his time are palpable. I have not read anything for young adults that so clearly explains and defines this influential generation of Americans. Having missed the Baby Boom by six months, I found this fascinating. I have a friend who lived in Canada for many years, not returning until well after Carter pardoned the draft dodgers in 1977. I've not read anything else by this author, but his writing was very powerful. I also gave this to one of our teachers who was born the year before Joel, and he was riveted by it. Weaknesses: One of Joel's neighbors goes to Vietnam and returns shell shocked and angry. He drops a lot of f-bombs. Given the historical context, and the very focused use of this as a component of the character after his tour in Vietnam, I will have to overlook this as justified. Here in the library: Thought I could have everything shelf read by 8 a.m. yesterday. So funny! Finished by 3:00 p.m. partly due to the fact I wasn't closed yet and students still had reports, etc. I also ended up weeding about 350 of the nastiest paperbacks and older titles-- I haven't bought a paperback in the ten years I've been here. You can imagine the odiferous pile of crumbling tomes. Reference Question of the Day: "Can you teach us how to hustle?" No joke. And yes. Yes, I can. Today I am CLOSED, but may have to watch about 30 students who haven't turned in books and therefore won't go to Field Day. Since I also need to do inventory, I can torture them with the incessant beeping of the hand held scanner! Always fun. The overheads begin their ritual migration to the library for purposes of worshipping the Great Overhead God-- pictures forthcoming. Kevin is just trying to make his way through each day at school. He loves photography, but isn't very fond of school... until Vanessa shows up. The minute he sees her, he thinks she is the most beautiful girl ever. When it turns out she also is interested in photography, he becomes so besotted that his grades start to slip and he can barely form a complete sentence in Vanessa's presence. He consults his friend Jack, the cologne drenched, super suave author of Girlfriend Management the Easy Way, and tries to employ a few of the tricks. He gets invited to Vanessa's birthday party-- but doesn't know it's her birthday. He figures out where her family is going on break and suggests his family go to the same place so he can (unsuccessfully) stalk her. All the while, Vanessa is fairly understanding, and Kevin comes across, in the opinion of Vanessa's father, like a blithering idiot. When Vanessa runs into some trouble due to her photography, Kevin is able to champion her cause, and is finally able to be around her without being so nervous and strange. Strengths: This was great! I have never heard of this author, but this short book (136 pages) was a winner! It is aggressively British, and there were some things he didn't quite understand. Still, as romance books for boys go, this had everything I was looking for and none of the things that would ruin it. Weaknesses: The Britishisms might throw some boys off, and the cover is not particularly appealing. It is not overly dated, with the possible exception of the mention of a Game Cube. This appeared in a box of donations from Half Price Books, which I am working on doling out to students for the summer. They were extremely generous with what they sent (seven boxes!) and they will be put to very good use. Of course, to show my support, it was absolutely essential to purchase the Best of Janis Joplin CD, which turned out to be just the angst-ridden-wailing kind of music that should have been the sound track for this year! This sequel to The Roar(2009) starts with an uprising of the implanted children, caused by Ellie and Mika being reunited. These children have been trained by the evil Gorman, a wizened character kept alive by drugs, to be his army, but Mika and a team of mutant children are trying to use the army for their own purpose, which is to overthrow Gorman. When the people of the North find out that there wasn't an animal plague that devastated the South and made it inhabitable, but that the people in the South wanted luxurious lifestyles for themselves and so imprisoned those who were less well-to-do in cramped housing in the North. When Mika and Ellie are sent by Gorman to spy on his evil counterpart, Raphael Mose, they decide to try to bargain with him, to no avail. There is great agitation in the North to blast down the wall and let the people from the North take over the South, but Mika realizes that humans are causing great damage to the planet, and doesn't think that the wall should go down until people are more conscientious about conservation. With the help of Helen, one of the richest women in the South, Gorman's assistant, and Mose's daughter, Mika and his army of mutants fight for a situation that will be equitable for all, but safe for the environment. Strengths: This has lots of action, and a good but not overly preachy message. I liked Helen's character a lot, and the struggle Mika has to do what is right is well done. The book design is quite nice. 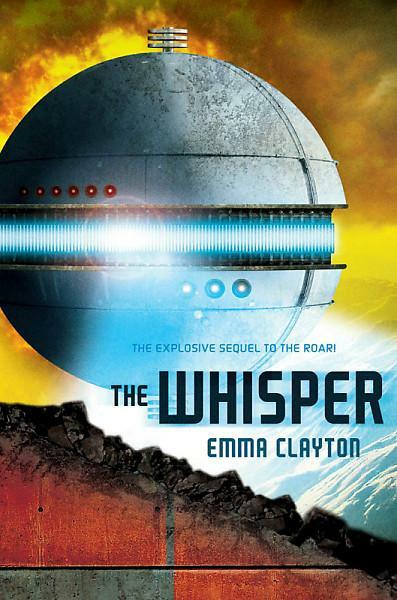 The first book in this series has been a slow but steady circulator for students who enjoy dystopian science fiction. 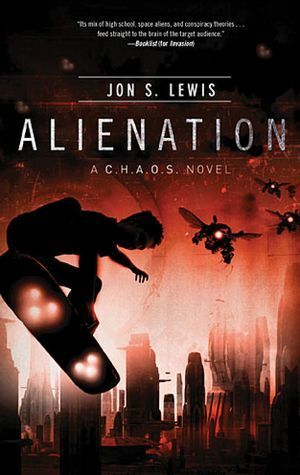 Weaknesses: It has been so long since I had read the first book that I was confused a bit, but after I warmed up, I enjoyed it. End of the Year Progress Report:The book fair is all done but the paperwork (and hauling out to the cafeteria to await pickup!) and the good news is that sales were high enough that we get cash profit. Book profit is okay, but since there are so few hardcover books, it's better to have the extra cash. Still 350 overdue books, which makes me hyperventilate. Will start calling homes again. Sigh. Have all of the nonfiction inventoried, with fairly few missing items. Will start shelf reading fiction, which desperately needs to be done. I straightened two shelves of "F ST" yesterday where not one book was in the right place. It's amazing that we can ever find anything. And that book about the top basketball starts of 1993? And the "Young and Black in America" from 1970? Also not useful for biography reports. Plus it smelled funky. I don't even count the days left. There are always, always too few! Tony's family is a bit confused, but very grateful, when Tony's great uncle Angelo leaves him his house in Boston, with the stipulation that the family live there until Tony is an adult, and Tony has the attic bedroom. This is great, because Tony's father is working on his PhD thesis on Paul Revere, so the family is strapped for money. There is some suspicious circumstances surrounding Angelo's death, and when a cranky neighbor, Mr. Hagemann, files charges against Tony's father, Tony wants to find out why the old man is so vengeful. This is made a little easier when Tony finds out that the baseball cap Zio Angelo gave him for his 13th birthday can conjure up Angelo as a 13 year old when set on a shelf that was made out of an ancient pawcorance. 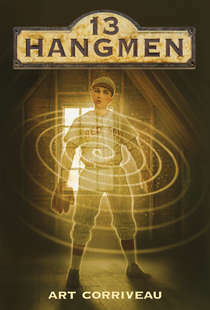 Not only does it conjure up Angelo (who met Ted Williams during a critical point in the baseball great's career), but a contemporary of Williams, an Irish boy who lived in the house, a freed slave boy... all as their 13 year old selves. It turns out that the Hagemann's have a very long vendetta against Tony's family, going all the way back to the time of Paul Revere. The Hagemanns want desperately to buy the house because of the rumors of treasure being there. The most recent Hagemann almost succeeds when Tony's house starts to fall to pieces and require more work than the family can afford. The only way they can stay is if Tony can consult the generations of 13 year old boys, figure out the secrets, and find the treasure. Strengths: Very strong sense of place, and interesting bits of history. I had no idea that Ted Williams was of Mexican descent and was forbidden to discuss this fact! The time travel element is realistically done, and Tony is a great character. The subplot about him trying to lose weight was a really good one. I enjoyed this and can easily get baseball fans to read it. Weaknesses: As in this author's first book for younger readers, How I, Nicky Flynn, Finally Get a Life (and a Dog), this was a bit long and convoluted for the target audience. There are a lot of details that bog down the narrative, like the information about Tony's dad. And really, I could buy the time travel, but I could NOT believe that Harvard offered his father a position. Thake, Richard. 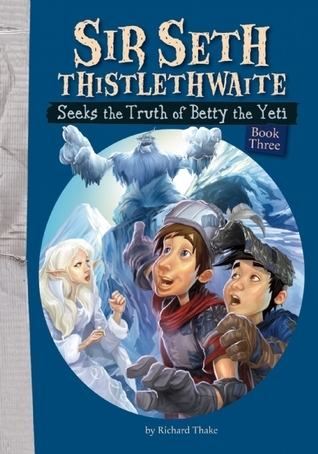 Sir Seth Thistlethwaite Seeks the Truth of Betty the Yeti. Sir Seth and Sir Ollie are back for their third adventure. Finding themselves high in the wintery mountains trying to stop a plague of avalanches, the two meet the elf queen Elynor of Ah Ah Kaachu, who tells them that Betty the Yeti is causing them. When they hunt down Betty, she informs them that the fault lies really with the Hole Thing, a giant blue caterpillar, which is located even further up the mountain. Ollie needs to get to New Kaachu to warn people of the next avalanche, and the fastest way there is to go through the Mids, which is the Snow Fleas' secret tunnels, but also where the evil Ghu lives. Seth continues up the mountain with Elynor to fight the Hole Thing, which is blocking a tunnel and causing the avalanches, while Ollie fights the Ghu. Can the two accomplish their missions and save the twon of New Kaachu from being buried by another avalanche, and also clear Betty the Yeti's name? Strengths: The prose in this is very lyrical and descriptive, and there is also a fair amount of action and adventure in struggling through their environments and fighting the monsters. Weaknesses: This had a lot of goofy names and situations that make it slightly more suitable for younger middle grade readers. Buzbee, Lewis. Bridge of Time. From the Publisher: "Best friends Lee Jones and Joan Lee have a lot more in common besides their names. On the eve of their class trip, they each learn their parents are getting divorced. Ugh. The class trip is a dud, so Lee and Joan steal away to talk. 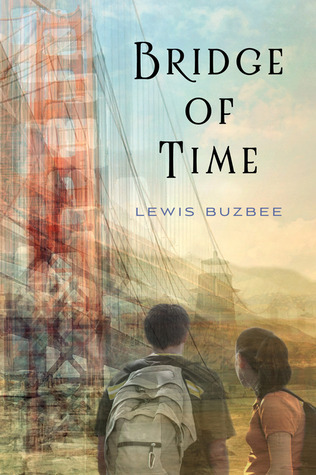 What follows is an afternoon nap in a lighthouse, walking up to find the Golden Gate Bridge gone - gone!- and meeting a young man named Sam Clemens, who is on the run from a mysterious stranger. Lee and Joan wonder: Where are they? What year is it? Why don't their cell phones work? How will they get back? Do they even want to? Will life everbe the same?" Time travel is a hard, hard sell at my school. It's enormously helpful if the concept is combined with a topic that students like, such as baseball, or involves explosions. The beginning of this book was so languid, and the Lee Jones/Joan Lee relationship so manufactured that I stopped reading and looked up information about the author. Sure enough, Mr. Buzbee writes more adult fiction than middle grade, although his Steinbeck's Ghost was well liked by people in California. If time travel, or California history, are big circulators in your library, go for this one. It was very well written, just didn't grab me. I'm excited to be hosting the Nonfiction Monday RoundUp today! Nonfiction Monday was started by Ana Suen. Here is the information from her site about what to do today! Bloggers across the kidlitosphere celebrate Nonfiction Monday by writing about nonfiction books for kids on Monday. o Write about a nonfiction book for kids next Monday on your blog. My nonfiction post this week has a couple of older titles, because I got them from two of our elementary schools that are being shut down. Central College and Longfellow were math and science magnet schools and always had great test scores and turned out fabulous students (Surly Teen Boy and Picky Reader went to Longfellow), but the buildings are old and not cost efficient to run. At least I was able to repurpose some of their books. I love magazines. I really do. But I realize that magazine exist to sell us stuff. That article in Family Circle about cleaning your kitchen in five minutes is always surrounded by ads for products. Fashion magazines are entirely devoted to making women think that the perfectly good clothes in their closet are out of style. I still like them. Do students understand how much is being sold to them? I'm not sure. This is a nice, short book that covers a lot of different ways this type of media tries to sway readers. This would be a good book to use in a class on media literacy. I don't love television. That has more to do with the hypnotic qualities of that electronic glow, but when my children were small, they were only allowed to watch PBS (and no more than half an hour of TOTAL screen time). As a result, I was never besieged with pleas for sugary breakfast cereal or the latest toy. When they were finally allowed to watch commercial tv, they were rather annoyed by the commercials, and we discussed what was being sold. Did the fruit chews really make people's heads explode? 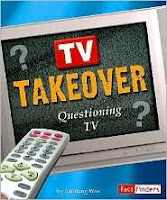 Again, for media literacy, this book is quite good, and interesting enough for students used to the fast pace of television to read! I especially like the discussions of product placement, because I don't know that students know about this. Jordy Lee and his friends who live in Toronto near Kensington Market all love to skateboard, but Jordy's parents (who run a local fruit and vegetable market) don't like him skating because they think he is a public nuisance. Because they work long hours, they would rather he stay home and take care of his younger brother. When a new skatepark opens and a contest is announced, Jordy wants to compete, because his board is old and he could use the gift card to a skate shop to buy a new one. He meets Ali, a very talented skater who also happens to be distractingly cute, and works with her on his tricks and routine. He is afraid to practice at the skate park with her, however, lest his friends make fun of him. He also has to figure out how to get to the competition when his parents don't want him to go. After working hard and figuring out a lot of things, the competition goes worse than expected in some ways... and better in others. Strengths: This was a really good skateboarding story. Jordy's relationship with Ali is real and sweet-- just what the boys want. Not mushy at all. 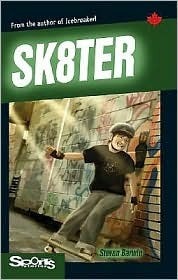 The skate boarding details are good, and the contest is a much better plot line than "people don't want a skate park". Need more books like this! Weaknesses: The Canadian setting might be hard for some of my students (a store for just fruit and vegetables? Slabs of meat hanging? ), and the cover, like all of the ones in this Lorimer and Company series, is beyond awful. 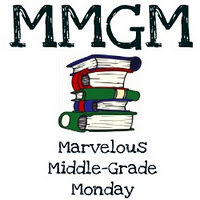 Marvelous Middle Grade Monday is a recurring feature at Shannon Whitney Messenger's Ramblings of a Wannabe Scribe blog. Hop over there to check out a list of great middle grade reviews. Visit some new blogs and get come recommendations today! increases significantly. When she sees an ice giant fight a fire giant while she is out on patrol, she realizes that Ragnarok is on its way unless she and her friends can stop it. Astley is still around, and Zara is starting to develop much warmer feelings for him, even though he is very upset when she "outs" the pixies at a town meeting where she tells everyone what is behind all of the attacks on boys and instructs everyone how to fight pixies. Frank/Belial is still around being evil, but Zara is more interested in what the partially zombie Hel, the guardian of the Norse underworld has to say. Zara and her friends travel to Iceland (I'll have to tell our former exchange student from there!) to visit the mouth of Hel and try to find out what they need to do to save the world. Astley's mother Isla is fighting the group, poisoning her son and turning Zara human again, just when she is falling in love with Astley and embracing her pixie powers. Zara is not going to let a little thing like losing her powers drag her down or stop her from finally putting down the pixie threat, or from keeping the world from ending. Don't want to spoil it, but the conclusion of this great series (Need, Captivate, Entice) involves a lot of fighting, suspense, and intriguing twists! 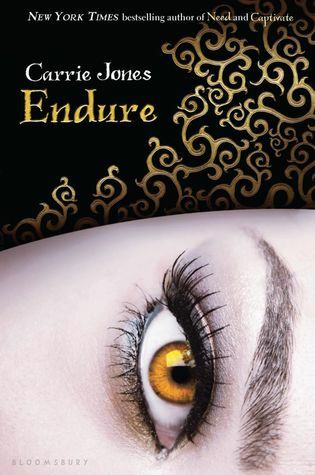 Strengths: Zara isn't as whiny and love struck in this book; she is much more in charge, and I liked that a lot. I also enjoyed the inclusion of Norse mythology, and how the group takes a commercial flight to Iceland but is able to teleport back. The character of Hel was intriguing. And, come on. Pixie Apocalypse? Great rock band name, and fun to say. Weaknesses: There were times when I got into the middle of a scene and though "Why are they doing this?" I'd page back to see if I missed some explanation. To be honest, though, this is probably more the fault of my extreme lack of sleep from the DC trip! Others have complained about the short length, but I think it was perfect, and four books for a series is very nice as well. Whew. Back from DC and getting ready to wrap up things in the library. After arriving home late on Thursday evening, I went in at 5:00 a.m. Friday to help set up for Bulldog Breakfast, which honors students who make our day. My nominee was Katie, who is such a dedicated library helper that when she was voluntarily dusting the tops of the bookshelves the other day, she didn't think the duster was enough and wet wiped them! The substitutes who were in for me did an amazing job, although I had to laugh when both said how busy the library was, and when I checked the stats, they had checked out only a quarter of the books that normally go out! All books were due yesterday, so any check outs had to be accompanied by sad stories, preferably with puppy dog eyes. Had my regular classes in as well as students taking end of year assessments on the computers, and book fair was delivered, so I got that set up, and made a dent in my hundred e mails. Must admit that I haven't read a book in a week, but my box from YA Books Central arrived, and I will spend the weekend getting my upcoming reading organized, just in time for Mother Reader's 48 Hour Reading Challenge on June 8-10. Oh, and Nonfiction Monday will be hosted here this week. Roman, Dave and John Green. Teen Boat. Teen Boat has more problems than the average high schoolers-- not only do bullies like Harry Cobbs bother him, they want him to host parties on himself when he is a boat-- parties that end up with gambling in international waters and running into ice bergs! Teen has a big crush on Nina Pinta Santa Maria, an exchange student, but no matter what he does, she doesn't like him... but his friend Joey (who is, of course, less hot because she wears overalls instead of midriff baring tops) does. The gang get into all sorts of improbable scrapes, travel to Italy, get involved with pirates, and use Teen's ability to turn into a boat at every available opportunity. 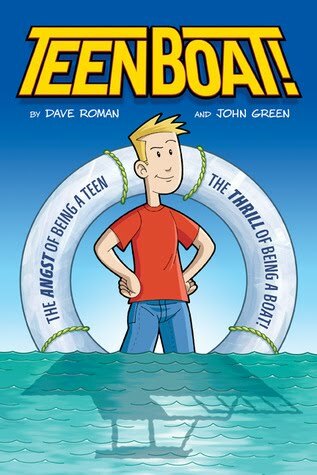 As we are reminded frequently, it's all about "The angst of being a teen; the thrill of being a boat." Strengths: This is certainly innovative and original. The artwork is well done and brightly colored, and the odd story line should appeal to high schoolers who were Pilkey aficionados when younger. Weaknesses: Since someone gave my son a Teen Boat t shirt, and he's been wearing it around and getting lots of comments about it, this was a family read. We were all amused by the book, but also a little confused as to what was really going on. I think this may have been the authors' point!